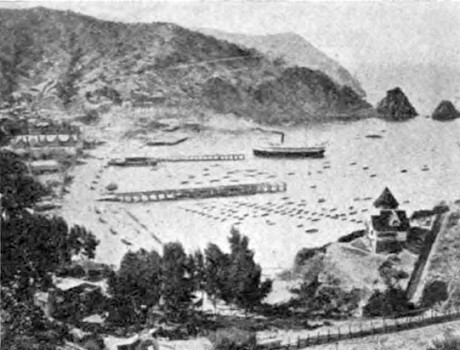 North American Press : Santa Catalina Island, 1914. 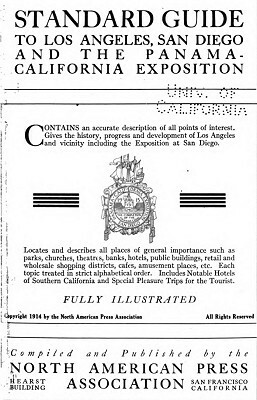 Standard Guide to Los Angeles, San Diego, and the Panama-California Exposition . The Press Association, San Francisco, California, 1914. The journalist reports that an Hawaiian surf rider is towed behind a motor-boat and sun-browned boys dive for coins thrown from the steamer or dock, a common practise in Hawaii from the earliest days of European visitors. Twenty miles off the Los Angeles harbor is Santa Catalina Island, twenty-three miles long, with an average width of four miles in the southern part, and two miles in the northern. The island possesses many attractions; mountain drives, picturesque golf links, salt water bathing, sulphur springs, hunting and fishing grounds, and the wonderful marine gardens, which are revealed through the glass-bottomed boats. Avalon, a picturesque town around the crescent-shaped harbor, is a. very popular summer resort, and no visit to Los Angeles is complete without a trip to Santa Catalina Island. Soon the semi-circular Bay of Avalon is well defined and, as the vessel draws nearer, the piers and background hotels and curio stores with houses climbing the hill behind. or oar-propelled, offers the only means of seeing the submarine gardens successfully. A larger boat, equipped with a search-light, announces an evening trip to the playground of the flying fish, or a day-light trip to the seal rocks. A Hawaiian surf rider dashes past on his surfboard tied to a motor-boat. Sun-browned boys are begging for coins which they dive for when thrown into the water. Far down into the clear depths one can follow the shining silver dime before it is seized by the diver, who never misses it. Amidst this crowd of boats and boys, accompanied by the shouting megaphones, the vessel draws up to the dock. and the Panama-California Exposition . Geoff Cater (2017) : North American Press Association : Santa Catalina Island, 1914.